Smoothing base coat that fills ridges to provide an even surface for manicures. For use on nails with pronounced ridges. Provides powerful protection against the peeling of nail layers. Bonding base coat secures nail lacquer for long lasting adhesion. Apply directly to clean, bare nails. The special formula increases the wearability of nail lacquer and decreases chipping from underneath. It also features a new plasticizer for greater flexibility and impact resistance. Great for restoring nails after the removal of artificial applications. Fast and fabulous, this protective top coat dries quickly over your freshly polished nails, achieving a glossy finish in seconds and the perfect seal around your polish. Made for more shine, Gotta Go! also provides you with a long-wearing manicure, guaranteeing true color and convenience, all at once! Provides a protective shield, which prevents lacquer from chipping and peeling. This formula offers chip control to provide maximum protection. It is a brilliant, clear and glossy treatment that produces a durable top coat that can double the life of the lacquer. It enhances scuff resistance and is strong enough to protect from harsh detergents and cleaning chemicals. Penetrates and dries all layers of nail polish quickly. A super-fast drying, protective formula top coat that extended the life of your colors while adding a brilliant shine. Matte Magic transforms your favorite China Glaze color from shiny to matte in seconds flat. Gives nails an extreme hi-gloss shine as well as enhanced protection against chipping. Contains 40% more polymer for an extreme high gloss shine. 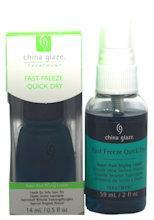 Super fast drying liquid dries all layers of nail polish in seconds.